The Service Architecture Lab is a leading research group with a focus on Future Services. The team works in collaboration with key players from industry and academia around the world. Our major areas of expertise are in Service Architecture, Network Softwaization, Social Networks Analysis and Internet of Things. Beyond academic research, we share and disseminate our results through active cooperation with leaders from the communications industry. The lab is one of the few academic groups that is contributing to standardisation at 3GPP, IETF, oneM2M and ITU-T, and is also heavily involved in collaborative research through national and European projects (H2020, ITEA, CELTIC). 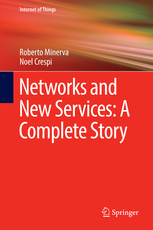 New book: “Networks and New Services: A Complete Story,” Springer International Publishing, 2017.